I was not sure how this would end up, and did not know if it was worth posting. The funny thing, is that I finished making the carpaccio, and thought let’s not go through the posting process, of writing and editing images, etc… since today I have not too much time to play around and blog, so I started eating it. Then I liked it so much that, I made a second batch for the pictures and decided to post it. With making recipes for the first time, you never know how the results will be, it can go wither way, sometimes you decide it’s not something you like, or you are disappointed and it ends there. No second time. Today it was a really nice surprise. You can definitely serve this as an appetizer, it’s light and fragrant, and open your appetite for the next course. I love daikon, after my trip to Japan, I ate a lot of them, then slowly I stopped buying them. I guess I am back into my daikon phase. Actually I prefer cooked daikon than raw, it does change its flavor end when cooked, the sweetness of the vegetable stands out. This recipe is quite simple and does not take long. You just need a mandoline, a griddle and a mixer. 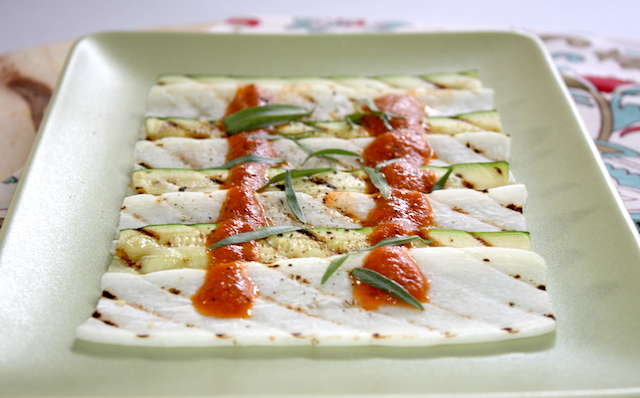 You could substitute daikon with avocado and tarragon with basil. It’s all about your inspiration, tastes and mood. Now go and play…and eat daikon! Heat up a grill pan at high heat. 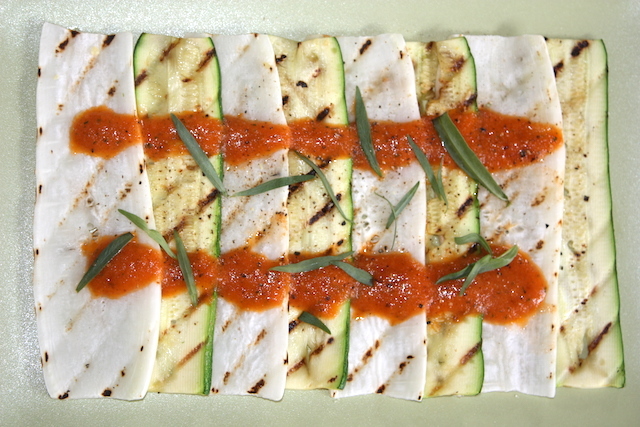 Place slices flat and grill a few minutes on each sides. Set aside. Place tomato halves in a tray and place under broiler until the top gets darkened and tomatoes soft. Let it cool and mix in a mixer with other ingredients. Strain through a sieve. Adjust with salt and pepper. 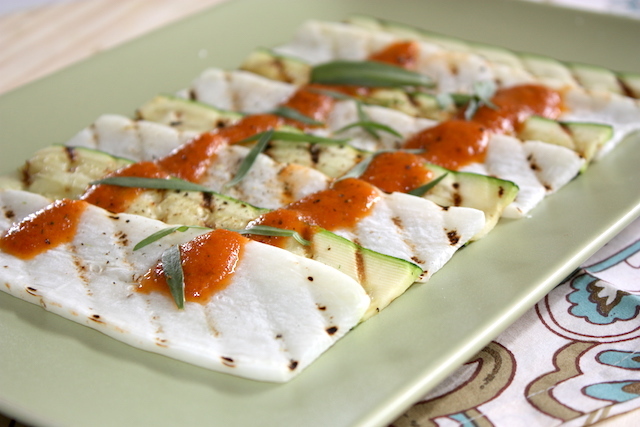 Lay one slice of zucchini on top of one slice daikon and repeat until used all ingredients. Top with coulis, decorate with tarragon leaves and eat cold or lukewarm. This entry was posted by silvia on April 20, 2017 at 12:00 am, and is filed under Appetizers, Express - Less than 30 minutes, Vegan, Vegetables. Follow any responses to this post through RSS 2.0.You can leave a response or trackback from your own site.